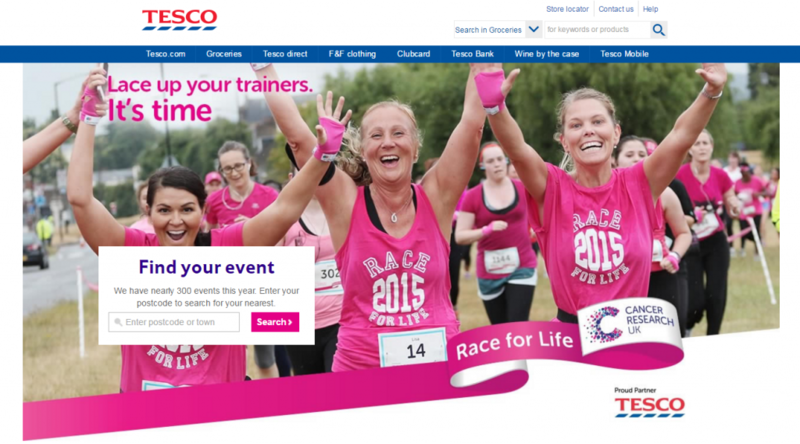 11 Strategies From The Paradox of Choice To Boost Conversions! Why More Is Less & The Paradox of Choice! 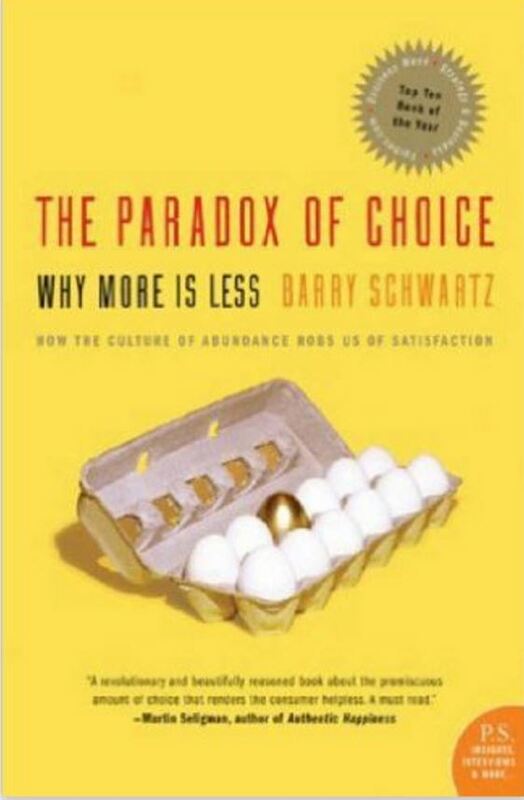 In his book The Paradox of Choice – Why more is less, Barry Schwartz challenges the myth that giving people more choice is positive and makes people feel in control. Rather, he suggests that the paradox of choice is that too much choice creates anxiety and reduces satisfaction with the choices we make. Choice overload also results in people freezing and not making any decision because they fear making a bad decision. To cope with the problems created by the paradox of choice Schwartz suggests eleven strategies for reducing the amount of time we spend making decisions and being happier with those decisions. In this post I examine these ideas and outline what conversion optimisation can learn from these insights. Strategies From The Paradox of Choice! Identify which choices really matter to you and concentrate your time and energy on those opportunities. There are costs associated with decision making. If you do not feel any better for using the time to make a decision you should consider what you have gained from the experience. Limit the number of options you give yourself and reduce the time and energy you invest in making less important decisions. Giving people too many options is at the heart of the paradox of choice. Avoid it all costs. Use anticipatory design techniques to simplify decision making by using data you collect on customer behaviour to predict user needs. This allows you to restrict the number of options you present to visitors to minimise cognitive strain. Spotify uses this approach to build a weekly personalised playlist for each customer. They achieve this by collecting data on past behaviour to build a taste profile for each customer. This allows them to apply an affinity score for each artist as an indication of how core they are to your tastes. It then uses a machine learning algorithm to analyse on-going behaviour to predict which genres you are most likely to be willing to explore new music. The algorithm then looks for users who have created playlists featuring songs and artists you also enjoy to identify songs that have been added to these playlists but that you have not listened to before. It then applies your taste profile to adjust its findings by areas of affinity and exploration to produce a personalised weekly play list – Discover Weekly. For e-Commerce provide prominent filters to enable selective browsing. Ensure your primary call-to-action is prominent and compelling. A clear visual hierarchy also helps to draw attention towards the decision you want the visitor to make. Anticipatory design is a great way of minimising the impact of the paradox of choice. Being a chooser is fundamental to the paradox of choice. A chooser considers what makes a decision important and if none of the options meets their needs they look to create different options. People become pickers when they experience choice overload. To become a chooser we must be prepared to rely more on customs, norms and rules to make less important decisions automatic. Provide guidance, such as links to how to posts, and buying tips to allow customers to simplify and shorten the decision making process. Customs and norms are important drivers of behaviour so ensure you use them to your advantage. This means complying with basic web conventions as people are creatures of habit and you are likely to increase cognitive load if visitors can’t find things where they expect them to be. Similarly research the market before launching into a new country to understand cross-cultural dimensions in website design and optimisation. Don’t fall foul of different web conventions because you don’t understand cultural differences in new markets. For example, Vehicle hire company Hertz uses the same domain (Hertz.com) for all countries that it operates in but uses different languages, visuals and appropriate copy to ensure it allows for cultural differences. People that maximise worry about regret to a greater extent and are also more disappointed when the consequences of decisions are not as positive as they hoped. Being willing to aim for a “good enough” outcome simplifies decision making and improves satisfaction. The paradox of choice is less of a problem when people become maximisers. Recognise for most decisions people are happy to satisfy rather than maximise. Avoid using phrases such as “ideal” or “perfect” solution as this is out of step with what your customers are looking for. Offer free trials or money back guarantees to reduce the risk from the customer’s perspective. The paradox of choice tells us that the more time we spend comparing alternatives when evaluating our most preferred option the less satisfied we tend to be with our final decision. This is because thinking about the best features of something we rejected will distract us from the satisfaction we receive from the selected item. This is why satisfiers tend to be happier with their choices as they see less need to undertake lots of research. Reduce the need for customers to do their own research by including a table of your product’s features compared with your main competitors. Ideally use an independent source and ensure it is a balanced comparison so that you show where competitors may have a better feature. People appreciate honesty as this helps build trust in a brand. People like the ability to return items they have purchased but what they don’t appreciate is that knowing that this option is available increases the probability that they will change their mind and reduces their satisfaction with the outcome. Agonising over whether we have a made the best decision is a recipe for misery. Indeed, when we are unable to change our minds we are more satisfied because our brains use a number of psychological processes to convince ourselves that we have made the best decision. Ensure you congratulate customers when they complete a purchase and remind them of why your product or service is one of the best on the market. In your confirmation email include testimonials or awards to provide evidence that customers are generally delighted with their decision to buy from your site. Don’t assume the process ends when a customer makes a purchase. Everything is relative and how feel about the choices we make is strongly affected by what we compare them with. Schwartz suggests that we can significantly improve our subjective experience by consciously being more grateful for the good aspects of what we purchase or experience. We are more likely to be happy with our choices if we reflect on how much better things are than they might have been rather than putting our focus on areas where alternatives might have delivered better outcomes. Gratitude works both ways. Ensure you show appreciation for your customers by giving them regular feedback on how they are doing. If they open an account, add something to their basket, download software or make a purchase congratulate them and make them feel important. Emphasize your strongest features in communications to reinforce the benefits of their purchase. Regret is sometimes necessary, but given the complexity of life today it is rare to come across any single decision that has the life-transforming power that we might thing it has. Further, when regret becomes so dominant that it pollutes or prevents decisions, we should seek to reduce it. Schwartz suggests people become a satisfier rather than a maximiser, limit the number of options we consider and practice gratitude for what is good about a decision. Regret is often caused by broken promises. Ensure that you deliver what you promised and align all your behaviours with your value proposition so that customers see that you practice what you preach. Customers show most loyalty to brands that demonstrate they have similar values and aspirations to themselves. The best way of showing this though is in your behaviour towards customers and employees. Support good causes that are consistent with your values and avoid policies and practices that are inconsistent with these standards and principles. Psychologists have noticed that people over-estimate how much pleasure or difference decisions have on our lives as we adapt more quickly than we anticipate. When times are hard this helps us to avoid the full impact of hardship, but when life is going well this places us on a “hedonic treadmill” which takes away much of the satisfaction we expect from a positive experience. Schwartz suggests we develop more realistic expectations about how perceptions change over time and reduce the time and energy we expend researching and deliberating over decisions. Allow for adaption by not over-promising or making out your product will change customer’s lives as few products or services achieve this. Be realistic and customers are less likely to be disappointed and return or cancel their subscription. Also use post-purchase communications to provide tips and suggestions on how customers can get the most out of their purchase. For example Music apps like Spotify and Deezer inform customers about new tracks, artists and playlists that they might like. Our perception of an experience is heavily influenced by how it compares with our expectations. Eliminating excessively high expectations is the quickest route to increasing satisfaction, but this is not helped by a world that encourages high expectations. Managing expectations is about clear and timely communications. London Underground improved satisfaction with its service not by running more trains but by installing LED screens on station platforms to inform customers about how long they would have to wait for the next train. Ensure that you keep your customers informed at each stage of the process and provide a range of genuine testimonials about how your product or service helps solve your customer’s problem. We often can’t help but compare ourselves with other people, but as Schwartz points out social comparisons may reduce our level of satisfaction with what we have. The old saying “you can’t take it with you” comes to mind when comparing what we have with the wealthiest in society. Schwartz suggests that we minimise social comparison because it can be so destructive. We are social and interconnected animals and as a result are heavily influenced by what we think other people are doing. Evidence that your brand is popular and trusted can be very persuasive for prospective customers. Social proof, such as testimonials, customer numbers, customer ratings and reviews give people the confidence they may need to transact on your site. However, social proof can also simplify choices by helping customers explore and try new options. 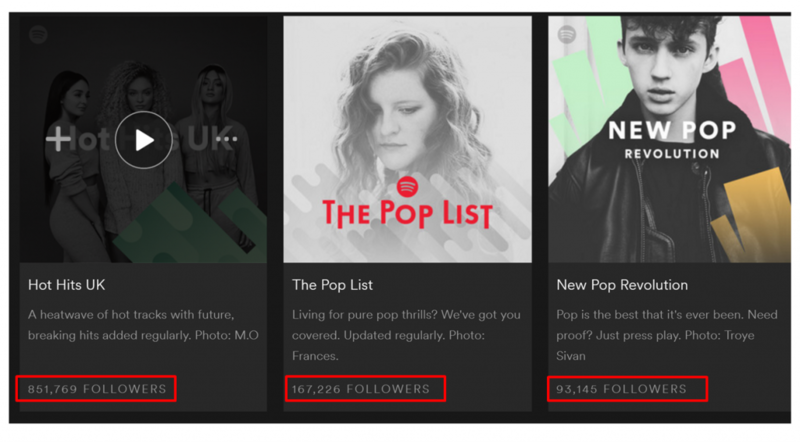 For example Spotify displays how many people follow each artist, song and playlist. This is a great way of encouraging people to listen to music they haven’t heard before as people often use popularity as a proxy for safety and avoiding disappointment. Always display some evidence of social validation on your site as people love to associate themselves with brands that are popular and are supported by similar minded people. Schwartz argues that freedom of choice can become a tyranny of choice due to the ever increasing number of daily options we are faced with. However, many people conform to rules, standards and norms established by society and create habits to speed up decision making. These strategies allow us to free up time and energy that we can spend on the more important decisions in our lives. Much of what we call brand loyalty is actually the result of customers forming habits. The most successful brands minimise friction and deliver a great customer experience to encourage habit formation. Examine your value proposition and your customer journey to identify ways to encourage habit formation or try piggy-backing off an existing habit as this is easier than creating new habits. Marketing communications should focus on disrupting existing habits rather than simply telling a story. The Paradox of Choice reminds us that sometimes when we think we are improving the customer experience we might in fact be doing the opposite. Don’t assume that you understand how your customers will react to a change. The paradox of choice demonstrates the value of using A/B testing and bandit testing tools to be used to reduce this uncertainty. Use them appropriately and they can save your organisation a lot of money. Thank you for reading my post and if you found it useful please share using the social media icons below. How Does The Backfire Effect Shape Beliefs? Why is auto-play always bad for conversions?